"The region of Beaujolais continues to heed the call for young vignerons who want to get in the wine game but aren't lucky enough to own their own vineyards. For those motivated people who are willing to ferret out the treasures, you can still find amazing, old-vine vineyards that can be purchased or leased for a relative "value" in today's wine world. As a result of this phenomena, a vibrant community of young winemakers, mostly farming organically, has developed and flourished in Beaujolais, working in an unusually collaborative way to make some of the most delicious and ethereal wines from the noble Gamay Noir grape. In fact, this sense of community started back in the 1980's with the so-called "Gang of Four" (Lapierre, Thevenet, Foullard and Breton) who helped to revolutionize the region put quality Cru Beaujolais on the map. But wine remained as a constant pull for the younger Sunier. So much so that when his brother Julien set up his own estate in 2008, he used to spend his vacations in the region just hanging out with his many amis Beaujoloises (Bojo pals), and working in Julien's vineyards and cellar. In 2012, he finally said "enough" and left his job to study Enology and Viticulture in Beaune. His studies led him into work stages at two Organic estates, Domaine Lapalu in Beaujolais and Chateau de Prémeaux in Burgundy. 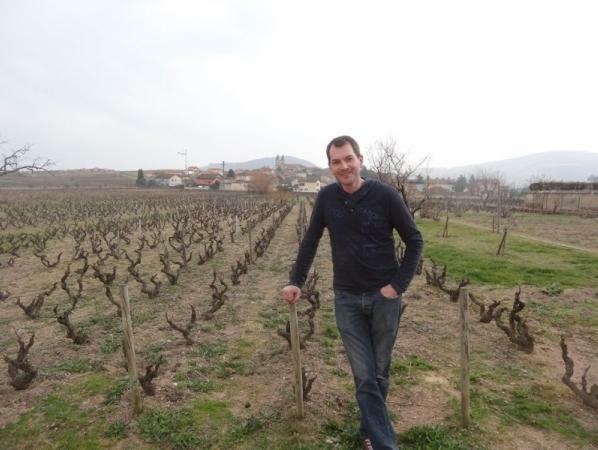 Antoine's Beaujolais debut in 2014 began with two wines, one from Régnié and one from Morgon. The Régnié comes from 2.7 Ha in the lieux-dits of Les Forchets, le Potet and Montmerond with an average vine age of 45 years, while the Morgon comes 1.2 Ha of 60+ year old vines from Croix de Chevre in the Grand Cras. Antoine admits that his brother played an instrumental role in helping him get set up, finding some choice parcels and sourcing all his equipment for the vineyards and cellar. Thanks to Julien's contacts, the vineyards themselves had all been extremely well maintained and farmed organically, the Régnié in "official conversion" and the Morgon certified for over a decade. The winemaking at Antoine Sunier starts with hand-harvesting of the grapes with careful sorting of the bunches in the vineyard. Fermentions occur using the traditional carbonic method in a closed vat with no de-stemming and only indigenous yeasts. The fermentations last between 8-15 days, at which point the grapes are pressed and flow by gravity into a combination of 80-90% used Burgundy barrels (8+ years old) and the balance in epoxy-lined concrete tanks. The élévage lasts 7-8 months, at which point the wines are bottled without fining and filtration and only a small addition of SO2 at the mise. Stylistically, it is easy to try and compare the wines of Antoine to those of Julien. There is an obvious kinship of spirit and technique that overlaps between the two domaines, not to mention actual "shared hands" in the birth of the wines. But as Antoine says, "we are working with different terroirs, in a respectful and organic way, so there will always be differences". For both producers, they walk the line between power and delicacy, and meatiness and grace. There is lovely fruit, but also a clear underpinning of minerality, and beautiful aromatic and textural lift. Antoine feels the wines should age well in the mid-term, certainly 8-10+ years easily. Indeed, it is clear there is a bright future for this exciting young domaine! The frères Sunier are some of the most warm-hearted and ebulliently friendly winemakers you will ever meet. They ooze with warmth and have smiles that are inherently quite contagious. It is hard to resist these fine-spirited people and the wonderful wines they craft. They characterize everything that makes the Beaujolais region and its producers so special."